Once again you asked for it and Steeda has delivered! The team at Steeda was asked to come up with a lightweight Jacking Rail system that didn't add a bunch of weight to your 2015-2016 S550 Mustang. Made in-house from the same material they have used to keep Fox Mustangs from flexing for 25+ years, these Jacking Rails feature CAD-designed, laser cut, high-strength steel brackets and stout 2" x 1-1/2" steel tubing. Powdercoated wrinkle black for a low key, yet durable finish, these will last a lifetime under your 2015-2016 S550 Mustang. Unlike the competition, Steeda includes Zinc-plated, flange-headed, grade 10.9 hardware - a simple bolt-in design that can be removed at any time as they use factory mounting holes. These allow you to jack up your Mustang with confidence anywhere along the jacking rail, preventing damage to your factory pinch welds. They provide a great point for jack stands and 2 post lifts. 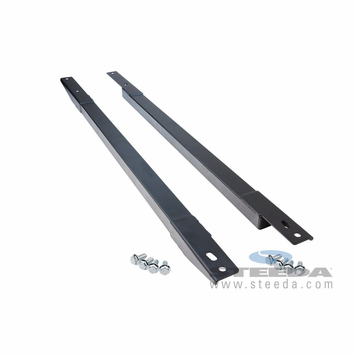 Lastly, these will work with Steeda's IRS Subframe Support Braces without interference. 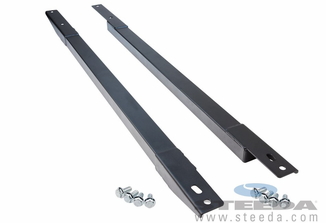 Steeda's new Ultra Lite Chassis Jacking Rails add strength and function to your modern muscle car.